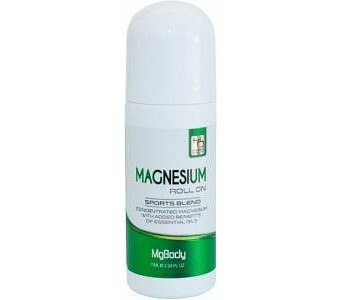 Mgbody Magnesium Roll On Advanced Sports Blend is made with essential oils that helps reduce post-workout muscle pain and inflammation. With a pleasant scent and instant stress relief, Advanced Sports Blend is the perfect recovery solution for all athletes and active bodies. Ingredients: Magnesium chloride, essential oils of eucalyptus, rosemary, cajeputt, lemongrass, and peppermint.